Hollywood paid attention to the American actress and comedian Jenny Slate after she participated in the movie Gifted together with her then boyfriend Chris Evans. She is also known for her voicing: for instance, she worked on Zootopia where Dawn Bellwether had her voice. 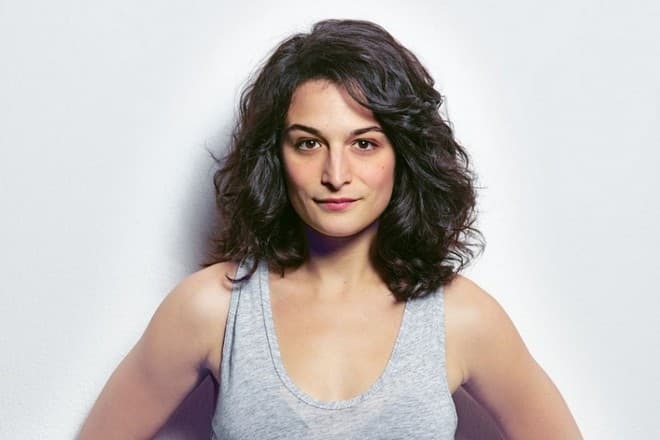 Jenny Slate was born on March 25, 1982, in Milton, Massachusetts, into the family of a poet Ron Slate and a ceramicist Nancy Gilson. The girl was the second child in the family. She had two sisters: the older, Abigail, and the younger, Stacey. Jenny is Jewish. 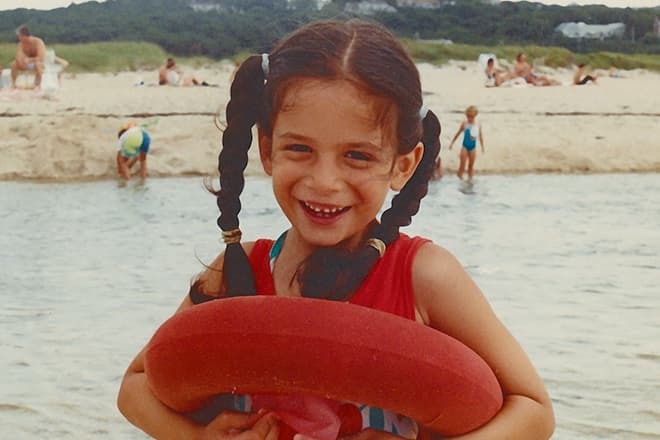 One of her grandmothers was born in Cuba into the family of a Russian father and a Turkish mother; she was brought up in France where she met a Jewish man and moved to the United States. Jenny graduated from the Milton Academy and finished Columbia University in 2004 where she studied literature. She met Gabe Liedman at the university in 2000; later, he became her comedian partner in the duo Gabe & Jenny. They performed in Max Silvestri’s weekly show Big Terrific. In 2008, a New York magazine Time Out called their sketches the best TV show. The artists often appeared in series: for example, they played detective partners in Brooklyn Nine-Nine. Jenny Slate is a woman of many talents: she has worked on TV programs, movies, and voicing. In 2009, she appeared on the TV screen for the first time in Jimmy Fallon’s Late Night. The same year, the young woman joined the cast of Saturday Night Live for a season. During the first episode “Biker Chick Chat,” she was so nervous that swore accidentally. Those who watched it live could hear that; the moment was cut off from the show recording. Throughout the show, Jenny tried the images of Kristen Stewart, Lady Gaga, Ashley Olsen, Olympia Snowe, and a salesperson Tina-Tina Cheneuse who offered to buy unique doorbells, car sirens, and alarm clocks. Saturday Night Live sketches with Slate were popular, but the program creators did not extend the contract with her. Nevertheless, the woman was an outstanding TV personality. For the next two years, Jenny was invited to the series Brothers, Ugly Americans, Raising Hope, and Bob’s Burgers; she had episodic roles. In August 2010, Jenny debuted as a scriptwriter. Together with her friend Dean Fleischer-Camp, Slate created and voiced a short cartoon Marcel the Shell with Shoes On. A shell named Marcel who was wearing tiny pink shoes became the main character. The cartoon was presented at AFI FEST where it was called the best animated short movie. In 2011, Sundance Film Festival and New York International Children's Film Festival critics appreciated this work. In November of the same year, Jenny wrote a children’s book Marcel. In 2011, the director Michael Mitchell offered Jenny the voicing role of the main character’s girlfriend in Alvin and the Chipmunks: Chipwrecked. As the story runs, Dave and Zoe are rescuing chipmunks from a desert island. In 2012, Slate voiced Ted’s mother in The Lorax and participated in an episode of the movie This Means War starring Tom Hardy, Chris Pine, and Reese Witherspoon. Besides, she worked on the series House of Lies and collaborated with Ben Schwartz, Don Cheadle, and Kristen Bell. 2014 was a successful year for the actress. She appeared in the comedy drama Obvious Child as a comedian who gets pregnant from a young man she accidentally met. The woman has to make a choice: to have a baby and raise them as a single mom or have an abortion. The movie brought Slate the Critics Choice Awards for Best Actress, Best Breakout Performance at the Newport Beach Film Festival, the Virtuosos Award at the Santa Barbara Film Festival, and Best Comedic Actress at the Women Film Circle Awards. Further on, the artist appeared in the first season of the series Married with Judy Greer and Nat Faxon. She also participated in several episodes of the second season; the actress Sarah Burns replaced her in a while. In 2014, Jenny also got one of the lead roles in The Longest Week starring Olivia Wilde, Billy Crudup, and Jason Bateman. 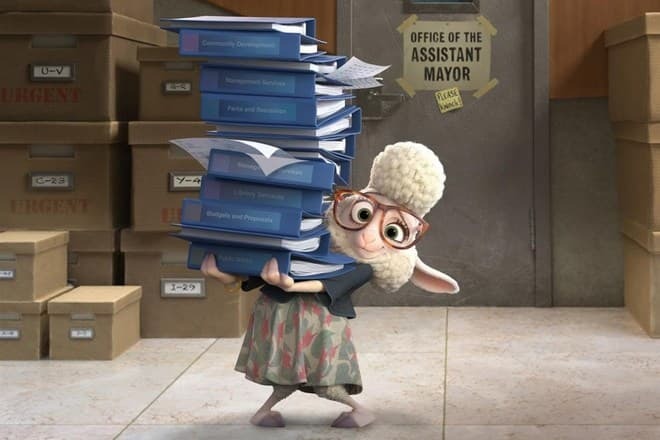 In 2016, Slate came back to voicing and worked on the roles of Dawn Bellwether in Zootopia and Gidget in The Secret Life of Pets. The next year, Jenny voiced Harley Quinn in The Lego Batman Movie. 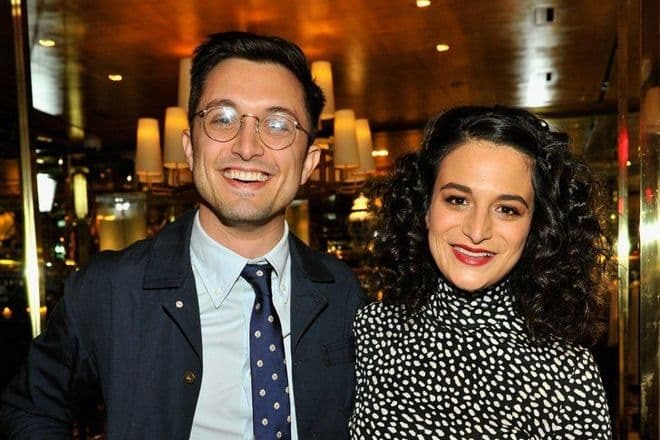 The next year, the movie Landline came out; Jenny Slate played Dana Jacobs, Ali’s elder sister. The girls suspect their father of unfaithfulness; Dana and her boyfriend have recently engaged, but she is cheating on him. Dana feels guilty which sometimes can lead to terrible consequences. There were several moments where the actress was wearing lingerie. Later, she told journalists it was the most unusual episode in her career. The same year, Marc Webb invited Jenny to his movie Gifted telling the story of a seven-year-old math genius girl; Slate took the role of the girl’s teacher. Unfortunately, the movie got into the list of “black” projects: critics expected much of it, but their hopes were not realized. 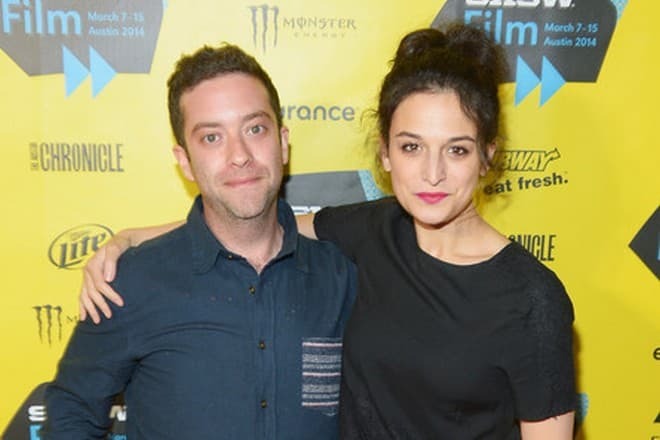 In September 2012, Jenny Slate married the director and movie partner Dean Fleischer-Camp. They lived together for four years and announced their divorce in May 2016. 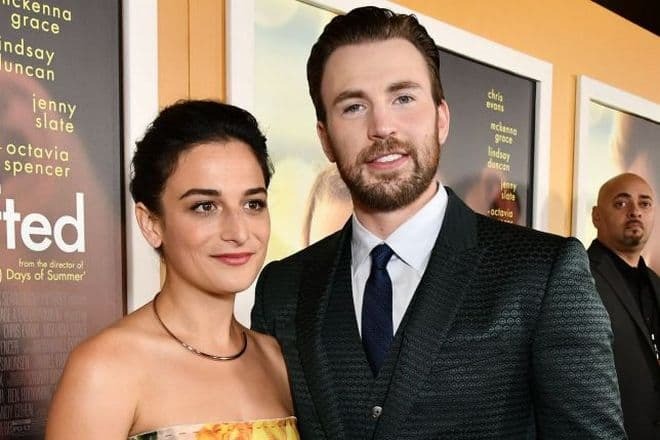 It took the actress a month to recover: in June, Jenny Slate and Chris Evans, her partner in Gifted, appeared at the premiere of The Secret Life of Pets and officially confirmed they were dating. They looked happy and infatuated at the ceremony. However, the affair lasted for less than a year: in February 2017, the couple broke up because of their busy schedules. As the actors’ official representatives said, Chris and Jenny were working much on their careers and had no time to see each other. However, they continued to communicate on friendly terms. In fall of the same year, the couple got back together again, yet Chris Evans told reporters about the second split-up in March 2018. The actress’s career is marked with the beginning of the breakthrough. In 2018, the movie Venom about the most famous antihero in the Spiderman’s universe moved to the stage of postproduction. Jenny Slate played Dr. Dora Skirth. Tom Hardy, Woody Harrelson, and Michelle Williams were her stage partners. In 2019, the sequel of The Secret Life of Pets will appear on the big screen; the actress will voice Gidget. The project is being created now. Jenny shares the details of her life outside a movie set on Instagram and Twitter. To keep fit, the woman is actively engaged in sports; her height is 163 cm., and her weight is 53 kg. She also likes to spend time with her friends, draw, and participate in photo sessions.